The main difference between primary secondary and tertiary structure of protein is that the primary structure of a protein is linear and the secondary structure of a protein can be either an α-helix or β-sheet whereas tertiary structure of a protein is globular. Primary, secondary, tertiary, and quaternary are the four structures of proteins found in nature. The primary structure comprises the amino acid sequence. Hydrogen bonds formed between amino acids are responsible for the formation of the secondary structure of a protein while disulfide and salt bridges form the tertiary structure. Primary structure of a protein is the amino acid sequence of the protein, which is linear. It forms the polypeptide chain of the protein. Each amino acid binds to the adjacent amino acid via a peptide bond. Due to the series of peptides bonds in the amino acid sequence, it is called a polypeptide chain. The amino acids in the polypeptide chain are one of those in the pool of 20 essential amino acids. 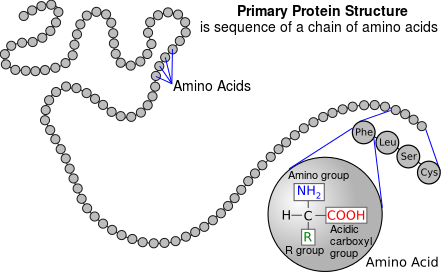 The codon sequence of the protein-coding gene determines the order of amino acids in the polypeptide chain. The coding sequence is first transcribed into a mRNA and then decoded to form the amino acid sequence. The former process is the transcription, which occurs inside the nucleus. RNA polymerase is the enzyme involved in the transcription. The latter process is the translation, which occurs in the cytoplasm. Ribosomes are the organelles which facilitate translation. The secondary structure of a protein is either an α-helix or β-sheet formed from its primary structure. It totally depends on the formation of hydrogen bonds between the structural components of amino acids. Both α-helix and β-sheet comprise regular, repeated patterns in the backbone. The coiling of the polypeptide backbone around an imaginary axis in clockwise direction forms the α-helix. It occurs through the formation of hydrogen bonds between the oxygen atom in the carbonyl group (C=O) of an amino acid and the hydrogen atom in the amine group (NH) of the fourth amino acid of the polypeptide chain. In the β-sheet, the R-group of each amino acid alternatively points above and below of the backbone. Hydrogen bond formation occurs between adjacent strands here, which lie side-by-side. This means the oxygen atom of the carbonyl group of one strand forms a hydrogen bond with the hydrogen atom of the amine group of the second strand. The arrangement of the two strands can be either parallel or anti-parallel. The anti-parallel strands are more stable. The tertiary structure of protein is the folded structure of the polypeptide chain into a 3D-structure. Hence, it comprises a compact, globular shape. So, in order to form the tertiary structure, the polypeptide chain bends and twists, achieving the lowest energy state with a high stability. The interactions between the side-chains of amino acids are responsible for the formation of the tertiary structure. Disulfide bridges form the most stable interactions and they are formed by the oxidation of sulfhydryl groups in cysteine. They are a type of covalent interactions. Also, ionic bonds called salt bridges form between positively- and negatively-charged side-chains of amino acids, further stabilizing the tertiary structure. In addition, hydrogen bonds also help in stabilizing the 3D-structure. Tertiary structure or the globular form of proteins is water-soluble under physiological conditions. This is due to the exposure of hydrophilic, acidic ad basic amino acids to the outside and hiding of the hydrophobic amino acids such as aromatic amino acids and the amino acids with alkyl groups in the core of the protein structure. Primary, secondary, and tertiary structure are three, structural arrangements of proteins. The basic unit of all of the structures is the amino acid sequence, which is the primary structure of protein. Secondary structure of protein is formed from its primary structure, which in turns form the tertiary structure. Each type of structure has a unique role in the cell. 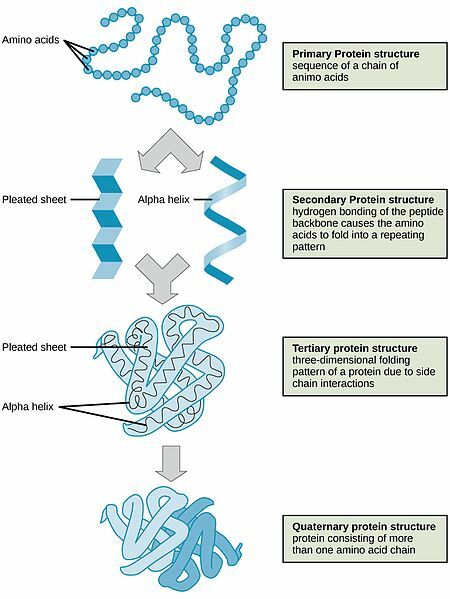 Primary structure of a protein is the linear sequence of amino acids, the secondary structure of a protein is the folding of the peptide chain into an α-helix or β-sheet while the tertiary structure is the three-dimensional structure of a protein. This explains the basic difference between primary secondary and tertiary structure of protein. As said in the definition, the primary structure of a protein is linear, the secondary structure of a protein can be either an α-helix or β-sheet while the tertiary structure of a protein is globular. Primary structure of a protein is composed of peptide bonds formed between amino acids, secondary structure of a protein encompasses hydrogen bonds while the tertiary structure of a protein encompasses disulfide bridges, salt bridges, and hydrogen bonds. This is a main difference between primary secondary and tertiary structure of protein. The primary structure of a protein is formed during translation. The Secondary structure of proteins forms collagen, elastin, actin, myosin, and keratin-like fibers while the tertiary structure of proteins includes enzymes, hormones, albumin, globulin, and hemoglobin. Their functions is yet another important difference between primary secondary and tertiary structure of protein. 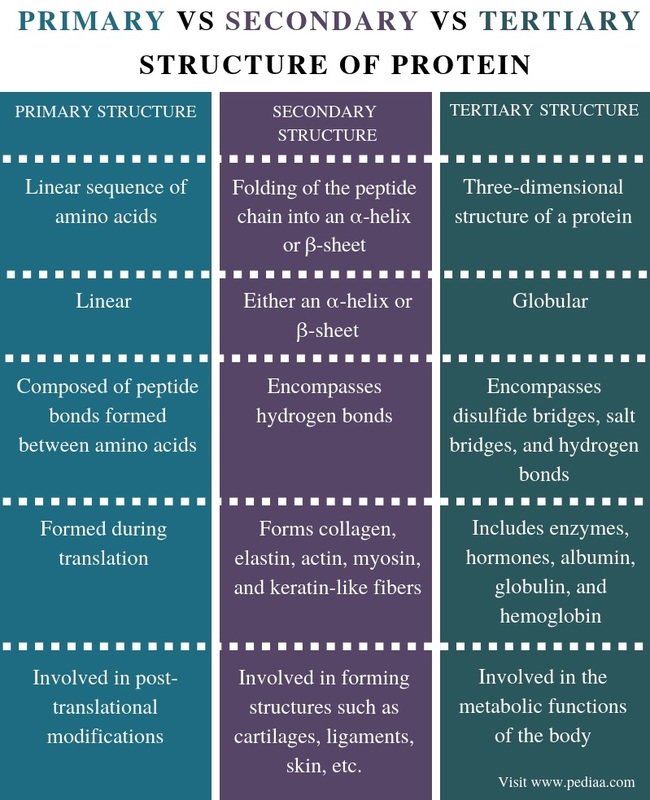 The primary structure of protein is involved in post-translational modifications, secondary structure of proteins is involved in forming structures such as cartilages, ligaments, skin, etc. while tertiary structure of proteins is involved in the metabolic functions of the body. Primary structure of protein is the amino acid sequence, which is linear. It is produced during translation. 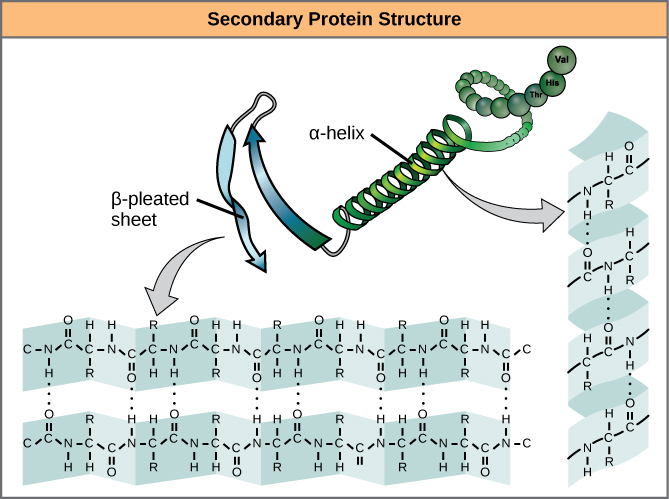 Secondary structure of protein is either an α-helix or β-sheet formed due to the formation of hydrogen bonds. It plays a major role in the formation of structures such as collagen, elastin, actin, myosin, and keratin fibers. Tertiary structure of protein is globular and it is formed due to the formation of disulfide and salt bridges. It plays a vital role in metabolism. The difference between primary secondary and tertiary structure of protein is their structure, bonds, and the role in the cell.